Israeli soldiers abducted, on Tuesday at dawn, 33 Palestinians from their homes after invading and violently searching them, in several parts of the occupied West Bank, the Palestinian Prisoners’ Society (PPS) has reported. The PPS office in Ramallah, in central West Bank, said the soldiers abducted thirteen Palestinians, including two women, in several parts of the governorate. The soldiers abducted Soheir Barghouthi, the mother of Saleh Barghouthi, 29, who was killed by the army on December 12, 2018. It is worth mentioning the Soheir also has three sons who are imprisoned by Israel, identified as Assem, Assef and Mohammad Barghouthi. The soldiers also abducted the wife of detainee Omar Barghouthi, and her brothers Zahi, and Saher Ismael Barghouthi. It is worth mentioning that, on Monday, the head of the Central Command of the Israeli army in the occupied West Bank, Major General Nadav Padan, signed an order authorizing the demolition of Assem’s home, while the soldiers handed the family an order for the demolition of Saleh’s home, after Israeli courts denied their appeals. Also in Ramallah, the soldiers abducted Yousef Husam Hneini, Firas as-Sayes, Mo’tasem Saqfelheit, Samer Abdul-Salam, Ahmad Abdul-Hafeth, Ismael Soheil Harb, Hotheifa Lutfi Barghouthi, Hamza Awwad, and a teen with special needs, identified as Ehab Ayman Khweira, 17. In Jenin, also in northern West Bank, the soldiers abducted Mohammad Bassam Ba’jawi, Mohammad Jawabra and Zeid Ahmad Ba’jawi. In Tulkarem, in northern West Bank, the soldiers abducted Adnan Abdul-Rahim Jallad, Ahmad Mohammad al-Lubbadi, Kheirallah Mahmoud Shafe’ey and Ezat Makkawi Shadeed. In Nablus, in northern West Bank, the soldiers abducted one Palestinian, identified as Amin Farraj. In Bethlehem governorate, south of occupied Jerusalem, the soldiers abducted Mohammad Nasser Deeriyya, Ibrahim Khaled Deeriyya and Fuad Mohammad al-A’raj, 16. In occupied Jerusalem, the soldiers abducted Hussein Abu Hussein Mashahra, Ahmad Mohammad Mashahra, Daoud Abda, Amer Abda, and Mohammad Daoud. 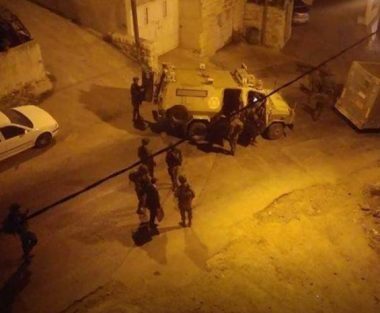 In Hebron, in southern West Bank, the soldiers abducted Mo’taz Abu Jheisha and Mojahed Mohammad Abu Jheisha. In Tubas, in northeaster West Bank, the soldiers abducted Ziad Abed Sawafta along with his sons Mahmoud and Thiab.